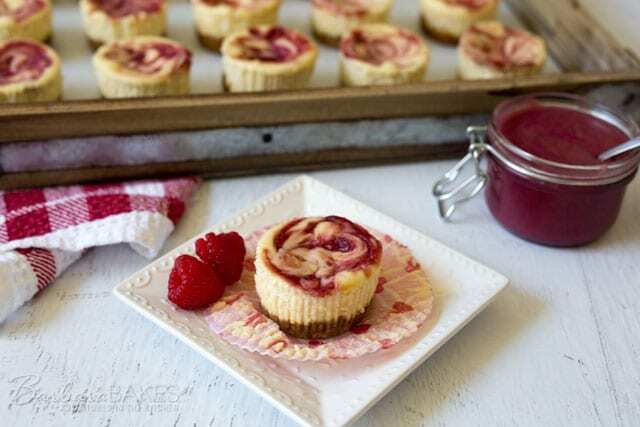 Rich, smooth, creamy cheesecakes swirled with tart raspberry curd in a fun mini size. 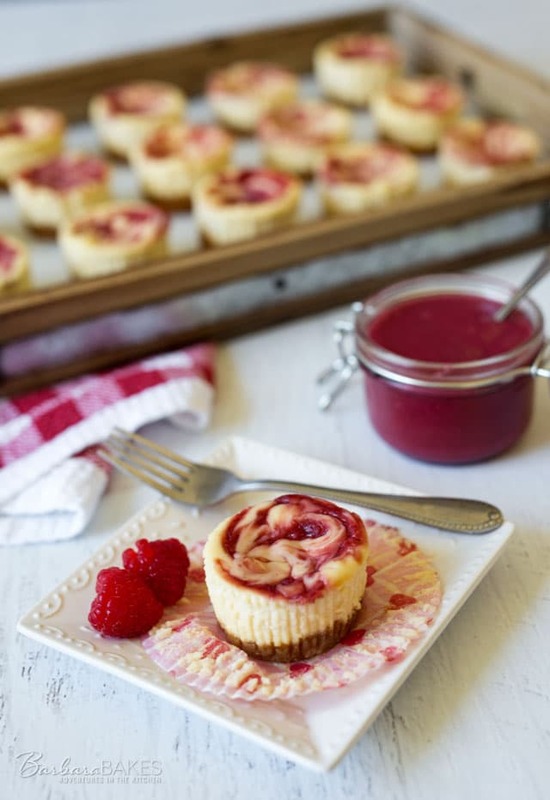 These Raspberry Curd Mini Cheesecakes are a quick, easy-to-make, stress-free dessert. This recipe is from a delicious new cookbook, The Weeknight Dinner Cookbook by Mary Younkin. Mary is a sweet friend and fellow recipe blogger. Her site, Barefeet In the Kitchen, focuses on cooking from scratch as simply as possible and she’s continues that focus in The Weeknight Dinner Cookbook. Details on how you can win a copy are at the bottom of this post. The cookbook is cleverly divided into sections based on how much time the recipe takes to make. The first section is 15 – 25 minute meals, next 30 – 45 minute meals, and finally 5 – 10 minute prep meals that cook on their own. Also included is a section of simple side dishes, condiments and spices, and of course my favorite section stress-free desserts. The recipe in the cookbook is Lemon Curd Mini Cheesecakes and uses store bought lemon curd, but I thought it would be fun to change it up and make a raspberry curd to swirl on top. I posted my Pressure Cooker Raspberry Curd recipe on Pressure Cooking Today. If you don’t have a pressure cooker yet, you could make it on the stove top instead. The cheesecake is a traditional cheesecake recipe except Mary changes it up and uses brown sugar in the crust and the filling, which adds a subtle but delightful caramel flavor. 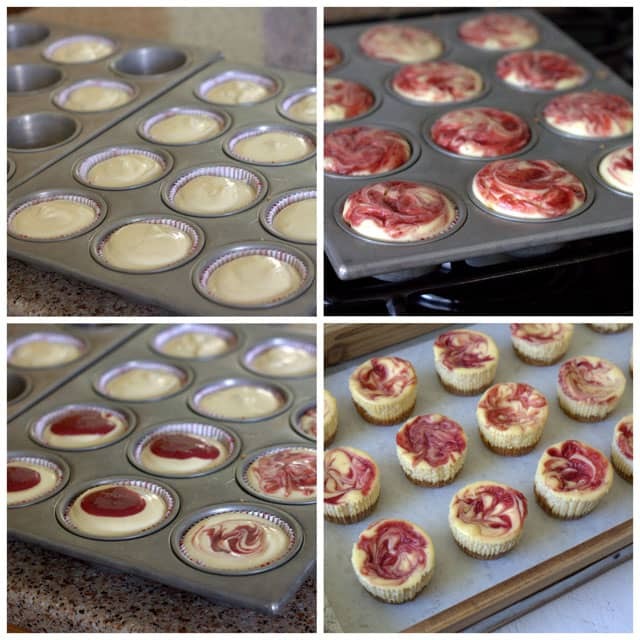 The mini cheesecakes are made in a muffin tin so they’re easy-to-make and easy-to-serve. These pretty little cheesecakes were enjoyed by the ladies in my neighborhood at our annual summer salad social. I should have made two batches because as soon as the tray was empty, someone asked where I was hiding the the next tray. I’m sure your guests will devour them too. Preheat oven to 325°. Prepare muffin tins with 16 liners. To make the crust, mix together the graham cracker crumbs, melted butter, and brown sugar in a small bowl. Scoop 1 tablespoon of the crust mixture into the bottom of each of the prepared liners. Press down the mixture with a small measuring cup of the bottom or a drinking glass. To make the filling, in a bowl, beat the cream cheese and both sugars together on high speed until smooth. Add the vanilla and the eggs. Beat again on medium speed until the mixture is smooth. Scoop 3 to 4 tablespoons (I used a #24 scoop) of the filling over the crusts, filling each cup almost to the top. Spoon 1 teaspoon of raspberry curd on top of each cupcake and swirl lightly with a toothpick. Bake for 24 minutes and then remove from the oven. The cheesecakes will be puffy and rounded when you remove them from the oven, but they will sink as they cool. Let cool at room temperature for about an hour, then transfer to the refrigerator and chill for at least 4 hours. Recipe from The Weeknight Dinner Cookbook by Mary Younkin. There were so many recipes I wanted to try from The Weeknight Dinner Cookbook I had a hard time deciding what to make first. Next up are the Cheesy Enchilada Rice Skillet dinner and the Mediterranean Nachos. 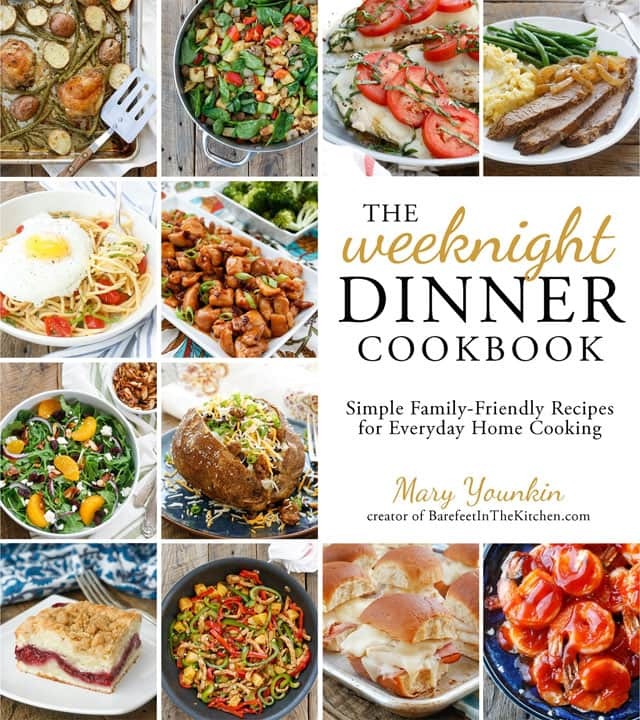 I’m giving away one copy of The Weeknight Dinner Cookbook to one lucky Barbara Bakes reader. Leave a comment on this post before Monday, September 12th at noon, MST and tell me your favorite Weeknight Dinner. Disclosure: I was given a free copy of The Weeknight Dinner Cookbook to review, but as always, all opinions expressed are always my own. We love pork shoulder made in our pressure cooker, seasoned with smoked paprika and hickory-smoked BBQ sauce. I just add 1 chopped onion and fresh thyme. Smells and tastes delightful – it’s my pulled pork recipe! I usually serve with potatoes dauphinoise and either steamed broccolini, or cauliflower with a creamy, cheesey sauce. Yum-mo! My favorite weeknight dinner is Ham and Cheese pinwheels. Kids love ’em and they’re not difficult to make! Looks amazing, so cute and easy single servings! my fav weeknight dinner is oven-baked fish and roasted veg! I am so happy you like the cookbook and enjoyed the cheesecakes! Your photos are gorgeous and now I’m headed over to check out your Raspberry Curd. That sounds AMAZING! Thanks so much Mary! Congratulations on your beautiful cookbook. I wish you much success. I have made your pressure cooker cheesecake that was just amazing!!!! These look wonderful and great size (if I can only eat one). I love anything I can cook in my Instant Pot. Like your cabbage rolls, meatloaf, mexican beef. Dinner for two in the Instant Pot would be great…… And I would love the cookbook. One can never have enough cook books, right? Thanks for the opportunity…. Any suggestions for what to make as a snack for a quilters retreat? Oh, YUM!!!!!! I’m always looking for quick weeknight suppers. These mini cheesecakes look absolutely ravishingly! I enjoy quick easy meals in weeknights….spaghetti carbonara! Simple and super easy to make. Our favorite weeknight dinners are anything Mexican. I love making Chicken Enchiladas with Mexican Rice or cooking a chuck roast and making Mexican beef to shred for Beef Burritos. Not only do we enjoy the feast on the night I make it, I have plenty left over to freeze for other quick weeknight meals down the road. Thanks Carol! Mexican is a favorite at our house too.